A second half collapse of epic proportions sent No. 7 seed Virginia Tech home early from the 2018 ACC Tournament. The Hokies led by 21 points in the second half, but somehow managed to lose to No. 10 seed Notre Dame 71-65 on Wednesday night in Brooklyn. Tech dropped to 21-11, and though they are still a lock for the NCAA Tournament, their seeding could be damaged to a certain extent. The Fighting Irish improved to 20-13, and their NCAA Tournament hopes remain alive. With 10:57 left in the game, Chris Clarke made a three-point jumper to put the Hokies up 54-37. They were dominating the game, and the Irish looked tired and lifeless. At that point, ESPN’s statistical formula gave Virginia Tech a 98.2% chance of winning the game. But it wasn’t to be, as Notre Dame started heating up, and the Hokies got cold. 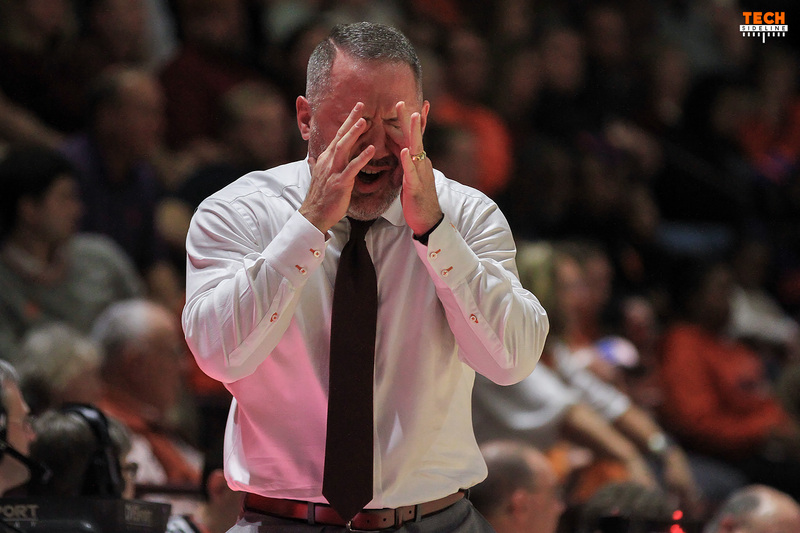 Tech also let a few questionable calls affect them mentally, and though many Tech fans are screaming at the officials following Wednesday’s result, the bigger issue was Virginia Tech’s reaction to those calls. The biggest call came with exactly eight minutes remaining in the game. Up 54-47, Chris Clarke was whistled for a charge, and immediately after the call Notre Dame point guard Matt Farrell grabbed the ball out of Clarke’s hands. Clarke responded by giving Farrell a slight shove, which sent the Notre Dame senior point guard falling through the rows of cameras behind the basket. When asked whether or not Farrell flopped after the game, Clarke was blunt. Nevertheless, Farrell couldn’t have flopped without the slight shove from Clarke. Farrell hit his two technical free throws, and the Irish got the ball, got fouled, and hit two more free throws, turning Tech’s 7-point lead into just a 3-point deficit. Notre Dame finally regained the lead with 2:02 remaining. Bonzie Colson, who was clearly tired and shot just 4-of-14 from the field in his fourth game back from injury, threw up a three-pointer over good defense from two Tech defenders as the shot clock was winding down. It banked in, giving the Irish a 60-59 lead. The body language of Virginia Tech’s players seemed to drop at that point, as Notre Dame completed the huge turnaround. Despite being somewhat lucky on the banked shot, and despite the tough call on Chris Clarke, head coach Buzz Williams placed the blame squarely on Virginia Tech. “Just completely fell apart the last 15 minutes defensively,” Williams told Mark Berman of the Roanoke Times. Notre Dame’s comeback was the opposite of what most considered to be likely with the Hokies holding a 21-point lead with 15:07 remaining. The Irish played a 40 minute game against Pitt on Tuesday, winning by just three points and playing just seven players in the process. They looked tired heading into halftime, particularly Bonzie Colson. Tech led 34-21 at halftime, and outscored them by a further eight points early in the second half. At the 15:07 mark, it was 47-26, and it remained at that score until Matt Farrell hit a three-pointer with 13:56 remaining. The Hokies had a huge advantage at that point, from everything to the 21-point lead, to the fact that Notre Dame played the previous day while Tech got a bye. But it didn’t matter. Not only did the Hokies struggle a bit defensively, but they couldn’t score. After they went up 54-37 with 10:57 left, they missed 15 of their next 16 shots, which allowed the Irish to get back into the game. Justin Robinson, who scored 15 points, summed it up the best after the game: “We just fell apart,” he told Mark Berman. For the game, Tech led for 29:19, and much of that time was spent with a double digit lead. The Hokies will head back to Blacksburg with a bitter taste in their mouth. However, they are a lock to be selected for the 2018 NCAA Tournament. The NCAA Tournament Selection Show will air at 6pm on Sunday night, and Virginia Tech will hold a Selection Show party in Cassell Coliseum that is open to all fans. Gates open at 5pm. I feel like Old Man Clemens in Billy Madison. One minute, we’re just sitting around the house in our underwear, enjoying life. The next minute, the doorbell rings and we open the door to find a flaming bag on our front porch, only to stomp it out and find that it’s poop again. This is a gut punch that I’m going to feel for a while. My personal pet peeve, and we saw it time and again last night, is the inability to finish the play at the basket. Getting to the hoop is half of the play — these guys need to finish! How many points did we leave AT THE BASKET last night? Call them bunnies, or chippies, or whatever — flush it if you have to, but finish the dang play! .. or get fouled doing it. As I am certain many fans did, I had something of a meltdown last night, upon witnessing the collapse. Up by 21, then we visit Brick City for the rest of the game. When ND came back and took the lead, helped by such events as a well defended, banked in three pointer at the end of the shot clock, you just felt that the Irish had solid possession of the Purple Horseshoe (c), and we were done for. I want to be optimistic. Buzz has done great things here, in a short period of time. Three consecutive winning ACC seasons. Last night, though, reminded me of Greenberg’s teams. Slaying the giant one minute, losing to a middle school team the next. An exaggeration, of course, but you know what I mean. Could it simply be that we just don’t have the horses to be a team that wins at least a couple of games in the Big Dance? I marvel at runs lesser teams have had. VCU. George Mason. Butler – didn’t they make it to the Championship Game twice in a row? What do these teams have, that we cannot produce? Gonzaga, anyone? Why are we never even a *threat* to make the Sweet Sixteen? Why are we never even considered a ‘sleeper’ team come tournament time? You know, a team that can get on a true roll. If we somehow get left out of the Big Dance this year, I won’t be shocked. Odds are we are in, but with our bubble history, you can never be certain. I felt the same way last year. I won’t believe we are in, until we get official word. Suffice it to say I will NOT be in Cassell on Sunday, just in case of a huge emotional letdown – like we suffered last night. Missed 15 of last 16 shots – has that ever happened in Hokie Bball before? Wow! This loss falls squarely on buzz’s shoulders. Unless I missed it he hasn’t shown the accountability that I would hope and expect in a situation like this. He called off the dogs and slowed things down way too early. Perhaps that was because our guys were gassed but again – it was HIS CALL. Saying the defense fell apart really throws the kids under the bus. I’m disappointed in abuzz right now. Missed 15 of the last 16 shots. That’s a big bus and Buzz didn’t throw anyone under that one. Are they REALLY “a lock for the NCAA tournament”? An RPI of 62 and loser of your last two games with an unimpressive OOC schedule? If I was on the selection committee I would look at VT hard. They really do have some nice wins but right now are they playing that well? I think they played themselves from into the tournament to on the bubble. And on the bubble anything can happen and your fate isn’t in your hands it is in the selection committees hands. I guess in the end I personally would put them in a play-in game. But I also think I would cancel any watch party and really not let any tv cameras in if I did hold one. This loss would be terrible on it’s on but it just magnifies a bigger problem that this team has had all year and that is holding onto leads at the end of games. Just recall the large number of games we should have won by double digits that we ultimately either lost or barely won. The 2nd UVA game shouldn’t have ever reached overtime, we should have won by 10, we should have beat Kentucky, Miami in the last game, Louisville the first time, ND the first time by 15 and it goes on and on. I’ve said before this team has some shooters that can get hot and score points but we don’t have a clutch player that can come forward that can get a basket when we have to have one. Also as mentioned by many before me, this team doesn’t seem to always play to their strengths. Each team member should know their strengths and weaknesses by now and alter their game accordingly. They haven’t thus far!!! Can’t remember a sporting event that left me as upset as last nights embarrassment since, well, maybe the Sugar Bowl (Coale caught the ball) loss. There are just no excuses. Players and coaches just choked. The thing I understand the least is that Notre Dame is basically a big (and slower team). We ran them into the ground in the first half and first five minutes of the second half. They were sweating like hogs, bent over grabbing their pants and trying to get their breath. That style of play nullified Coleman, as he does not have his legs back yet. It took away their bigs on the inside to a degree. We get a 21 point lead and then we do exactly what they wanted us to do and prayed we would do and that is slow it down; walk it up the court; and take all of our energy away and try to play a half court game against a team that lives by playing the half court game. We never got any energy back. Our half court game is weave at the head of the key while everyone else stands around the three point line hoping to get to pump up a bad shot. No movement, no inside picks, and no cuts. AND, the coaches let that happen. Couple that with Bibbs not being able to hit an important shot in a game since 2017; Robinson wanting to drive like he was one on one, when three guys were waiting for him in the lane every time; and most infuriating, our 6’10” center, thinking he is a guard and pumping up threes with no one else within 15 feet of the basket (which he has done in each of our recent losses). He is a guard in a centers body and plays like it. Problem is he IS NOT a guard or even close. He never dunks when he has it inside and plays like he is scared of someone’s big brother. A-W vanishes completely sometimes and needs to asset himself when we are struggling. That game had me chewing nails. Disappointed that Buzz let it play out like that. You could see it happening clearly and almost in slow motion (emphasis on the slow, which is what got us beat). I feel the pain too. Only issue I take with analysis is I think Blackshear is a truly solid and complete player. Definitely he should not have taken the 3s after he missed the first one – but they were wide open shots. He plays the game right and works hard from what I see. There is a reason we lose when he fouls out. I’m glad we have him because otherwise absolutely no big man at all. Hmmmm… choice. Play all out to do well in the ACC in Brooklyn, or get rested for a big run in the tournament that matters most (and, let ND win to get another ACC team in the Dance). Actually a good choice, despite giving us a bad seeding. One could then argue all teams in the Dance are capable. And one could argue they are not. A loss like this kills all mental aspect no matter days off. This team will not make a run in tourney as they have lost two straight while up at half and completely exploded last night. I believe they are mentally done. Not trying to start any argument but just not understanding your logic here. I appreciate you trying to find the positive spin on the collapse last night but the only positive is we are lucky that the Hokies get to see another day and play another game. Agree. If we had won yesterday and lost today the soonest we would have played would have been next Thursday which is more time between games than we normally have between games. I’ll take a win over an embarrassing deflating loss EVERY DAY! If that was a “choice”, and I don’t for a SECOND believe it was, it was the worst choice since scrapping Classic Coke for New Coke! Choose to Lose? I hope not. I don’t have the words to describe how I feel about last night’s game. Even if I had the words I would be unable to post them because they would not be fit for the public to read. This team is capable of winning but can’t stand success. I must say that some of this is clearly on the coaches. When you see a train wreck coming at least call time out and stop the bleeding. Right now I could care less about basketball. I’m ready for a rest from any of the sports but football season will soon be here. Enough disappointment for me at the present time. Well, to ND’s credit, they starting going inside, forcing us to collapse the defense which opened up their 3 point shooters. Something our size hasn’t handled all year. Offensively, that made us a more half court team, which we seem to struggle with. The last 10 minutes of the game our guys had that deer in the headlight look. No team work. We lost because we are exactly what I said we were after beating Duke, we are the Forrest Gump box of chocolates, “you never know what your gonna get”……………we can beat or lose to anyone! So true. This team could beat anyone on any given night and then turn around and lose to the school of the deaf and blind. You never know what you are going to get. Every game is a heart attack. I want more consistency. Buzz you better get a good shoulder workout in today, because that is exactly where this embarrassment belongs…on your shoulders. Mr Clark remains one of my favorite players. However, in life, if he does not learn to curb his emotions better than he has on recent occasions, a technical foul will be the least of his worries. You must have never played competitive sports. He could have done much worse like actually giving the guy a real push. He has earned his money. Come on Whit use your real user name. Real problem right now is on the offensive end. Hill, A-W are producing NO offense which compounds their defensive deficiencies and Wilson’s defensive prowess is nowhere near good enough to overcome his deplorable offense. If Wilson lacks the confidence to shoot a mid range jumper then he should not be starting. When he is on he court we are playing 4 on 5 and that cannot happen. Like he did earlier in the season, Buzz needs to shake it up. Perhaps working on offense in practice a little more would help Hill and A-W get out of their shooting slumps! Wilson does not lack confidence. I don’t think he is allowed to shoot. Role player… his role is defense. Unacceptable to have a starter that can’t play both sides of the ball…. Been going to VT games 55 years. Endured Hussey, Stokes, JJ, F. Allen; unbelievable futility & incompetence. I have to say right now, I can’t remember anything as bad as those 15 minutes. Totally agree. Turned off the TV when CC rec’d the technical- the complexion of the game truly changed & the players quit. Zack Leday would not have allowed this to happen last year- very sad. I could care less about the NCAA, as this bunch is going nowhere except home fast. This is the most sis succinct and accurate comment thread I’ve read about last nights debacle. I agree completely. Tough loss but everyone needs to look at the big picture. Just like after the Louisville loss when we beat Duke two days later…..this shall pass. Growing up in Virginia, the acc tourney was huge, and it still matters. However, remember the ultimate goal of this team has always been to be a force in the tourney, and they will. I really would not want to face this team next week…and despite tonight, our guys are going to continue to make us proud. Gave that one away, at least now it will be ND that gets blown out by Duke tomorrow night. The technical is just another example of CC losing his cool and he will be targeted by others going forward to bait him, very disappointing. This was simply embarrassing. Buzz should put the kids on the Bus and send them home immediately, and then go recruiting somewhere. If we missed 15 of 16 shots after the 10:57 mark in the 2nd half I’d say we fell apart offensively, Mr. Williams. I’d have to say allowing ND to score 45 points in the last 15 minutes had a lot to do with the outcome as well. Ripped are hearts out on this one. We had opportunities to be even farther ahead in the first half and we didn’t take advantage of it. How about the 4 on 1 when we ended up shooting and missing the 3 and losing the rebound and ND converted a break on the other end. I don’t if this was intentional but KJ was left open for 3 3s in the ND comeback and he missed all of them. Earlier In the game he got the ball right under the basket. He could have laid it in but opted to kick it out for a 3 which we missed. Suggests we might be getting too 3-focused when we pass up easy 2s. And we quit running the offense late in the game and scoring attempts were all individuals going one on one and they were very tough shots. Clarke was clearly frustrated that he couldn’t beat his man off the dribble as he had done in recent games which led to his forearm shove that got him the charge call and then the technical. Maybe we should nickname Clarke Mr. T. ND tried to help us with 2 moving screen calls but it just delayed the inevitable. This team does not seem like th kind of team that could go on a tournament run. Hoping for one win so we don’t close out the season with 3 losses after the euphoric Duke win. 2nd time in less than a week having our hearts ripped out, Saturday on a controversial foul call with 3 seconds remaining, and tonight on a second half stack up of calls/no calls having negative consequences for us. Officiating isn’t the only thing, but it sure is making a significant impact on the outcomes of our games of late. Sorry, while I don’t disagree that our defense was lousy in the 2nd half, to say that officiating had nothing to do with that loss is baloney. The kids were hosed repeatedly on calls and no calls in the 2nd half and they let it affect their play. This article is right on the money….and it hurts! It hurts a lot! Maybe next year they’ll develop that killer instinct to finish off an opponent when they are down.